A dark lane is seen stretching across this false-color, mid-infrared image of a small piece of the Milky Way. 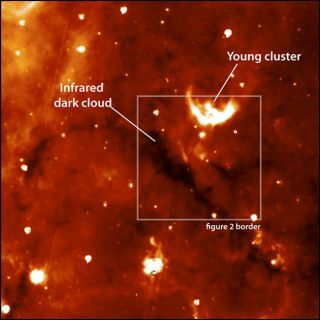 These infrared dark clouds can potentially form young stellar clusters like the one seen in the upper right of the figure. PASADENA, CALIF. ? A massive, tranquil object foundlurking in a dark cloud in our galaxy could be about to transform into amassive star or stars, giving astronomers their first glimpse at such a regionon the cusp of stellar birth. The cloud,located near the Aquila rift in the galactic plane 23,000 light-years away, hasa mass 120 times that of the sun, but it is all compressed into a volumesmaller than the Oortcloud of comets orbiting our solar system, astronomers said here today atthe 214th meeting of the American Astronomical Society. Thetemperature of the cloud is less than -427 degrees Fahrenheit (-255 Celsius). Massivestars, or those that weigh in at more than eight solar masses, are much rarerthan more intermediate-sized, sun-like stars. The stellarwhoppers produce much more radiation, causing them to lead short,spectacular lives that end when they die violently in supernova events,explosions that are so luminous they can briefly outshine an entire galaxy. In theirdeath throes, these stars can quickly destroy any evidence of the environmentthey formed in, which makes it difficult for astronomers to study the birth ofthese beasts. Butcatalogs of cold, dense gas clouds, such as the new one found with theSubmillimeter Array (SMA) atop Mauna Kea in Hawaii, are now giving astronomersa chance to probe regions that look likely to spawn massive stars. "Perhapsthe most exciting thing is that we now know that massive and dense cores withno sign of star formation activity do exist," said team member JonathanSwift of the University of Hawaii at Manoa. How massivestars form is a matter of fierce debate. Studies ofnearby star-formingregions show that smaller, sun-like stars form inside dense cores ofmolecular gas, but whether or not massive stars form in the same manner isn'tknown. Someastronomers say that if massive stars were to form in a similar process, theircores would have to hold 100 solar masses of material in a relatively compactvolume. "Themass and density of this object along with the lack of evidence for starformation activity is unique, and this fits very well with our expectations formassive pre-stellar cores," Swift said. Recenttheoretical studies and computer simulations suggest that a core such as thiscould form massive stars in as little as 50,000 years ? a blink of an eye inthe life of the universe. More studyof this region is still needed, Swift noted, and astronomers plan to use theSMA to probe the cloud more deeply.